Members of UCF’s Cyber Defense Competition Team – all computer science and information technology students – were treated this week to a tour of Washington, D.C., for capturing the Raytheon-sponsored National Collegiate Cyber Defense Competition crown: a repeat title for the UCF team in its third year. The packed three-day tour included a visit to the White House and meetings with the nation’s top cyber security officials. Other trip highlights included a visit to the U.S. Immigration and Customs Enforcement’s new Cyber Crimes Center in Fairfax, Va., and a VIP tour of the Capitol Building by U.S. Rep. John Mica (R-Florida). During the tour, Mica announced Raytheon’s $25,000 donation to the UCF Foundation’s Raytheon Endowed Scholarship fund, bringing the company’s total gift to $50,000 in one year. Read Raytheon’s full story here. 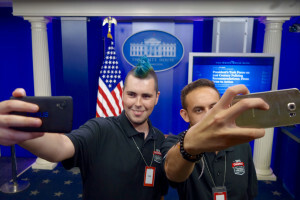 Pictured: UCF information technology students Alex Davis and Andres Giron-Arias take selfies during a White House West Wing tour in the James S. Brady Press Briefing Room, July 29. Photo provided by Raytheon.